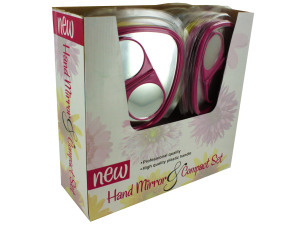 Ideal for tweezing, plucking and applying make-up; this set includes 1 handheld mirror and 1 double-sided compact. Hand mirror is perfect for keeping in bathrooms or vanities while compact is small enough to fit on dressers or inside bags. Compact has both a regular and magnified view. Colors include magenta, blue and yellow. Set are packaged inside a counter top display. There are 12 set per display.